Laid low, y'all. Laid low. It's not endemic in Arkansas, though. I went back to school on Monday, which was probably a mistake, even though all I had to do was meet students for conferences over their papers; and on Tuesday, which was definitely a mistake. I taught for about forty minutes (I do not remember most of what I said -- I vaguely remember going off on a rant about Plato), realized I was very close to passing out, and sent them home. Today, like a miracle, I am all but well. 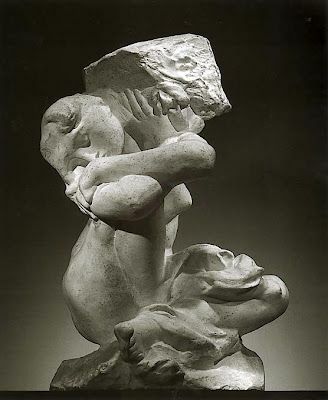 Lying there on the sofa at my sickest, though, racked with misery, fever, and pain, I thought about Elizabeth Barrett Browning -- who lived for years like that, in pain like that, unable to move from a sofa, and all the while managed to write poetry*. A better man than I am. *I couldn't write. I read, during the hours I managed to stay away, straight through Kage Baker's Company series. The entire thing. Two of the kid's friends have come to visit, so I have a house filled with young adults. These are her two best friends, Rabid and Neon (those are net names). She met them over the internet, which according to internet lore means they ought to be 57 year old pedophiles. Instead they are nineteen and twenty-two and delightful. They've spent the week talking comics (they are all web comic artists), catching Pokemon, drawing and discussing their drawings, and watching movies. On Friday we went up to Crystal Bridges. It's much more amazing in person. I tried to find prints in their gift shop, but no go. Then yesterday we drove up to Devil's Den to hike Yellow Rock trail. It was hot and humid, but due to all the rain we've been having lately, so green. And so many flowers. More hikers than I've ever seen up there as well. My little pack of artists were hiking on only five or six hours of sleep (they have also been staying up until four-thirty every night) but seemed to enjoy the climb nonetheless. Many hikers had their dogs along which helped. Also we saw tiny toads, lizards, and also one snake. When we reached the top, some adorable Christian had used the loose rocks of the scree to spell out GOD! in big rock letters. My kid (making an annoyed face): "Rabid. Help me change this to GOD IS DEAD, okay?" But instead, what they did was rearrange the rocks to read DOG. "After all," as they put it, "God is probably a dog. Or at least he likes dogs." Apparently this summer I have decided to read a great deal of 1960s/1970s SF written by men. 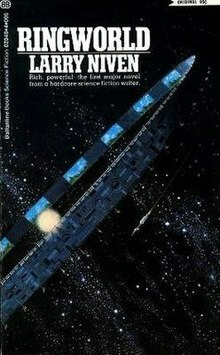 Ringworld, written by Larry Niven, was published in 1970. I read it as a kid. I can't remember when, exactly, although it would have been sometime after it was published, probably when I was fourteen or fifteen. It was the first Niven I read, and I do remember liking it. I liked it a lot. I liked it so much, that I read every book I could find by Niven, no matter how terrible they were, right up until Footfall, when I just gave up. I couldn't take anymore. I am currently reading -- I can't even remember why -- two SF novels published in the 1960s, both by men. One is Robert Heinlein's Stranger in a Strange Land, which I read I was (much) younger, and a big Heinlein fan. The other is William Nolan's Logan's Run, which I had never read before. One point I'm going to make up front is that, wow, science fiction is terrible at predicting the future. The second is that these particular SF writers certainly have an interesting attitude toward women. The third point I will only mention: LGBT issues. Yeah, wow.